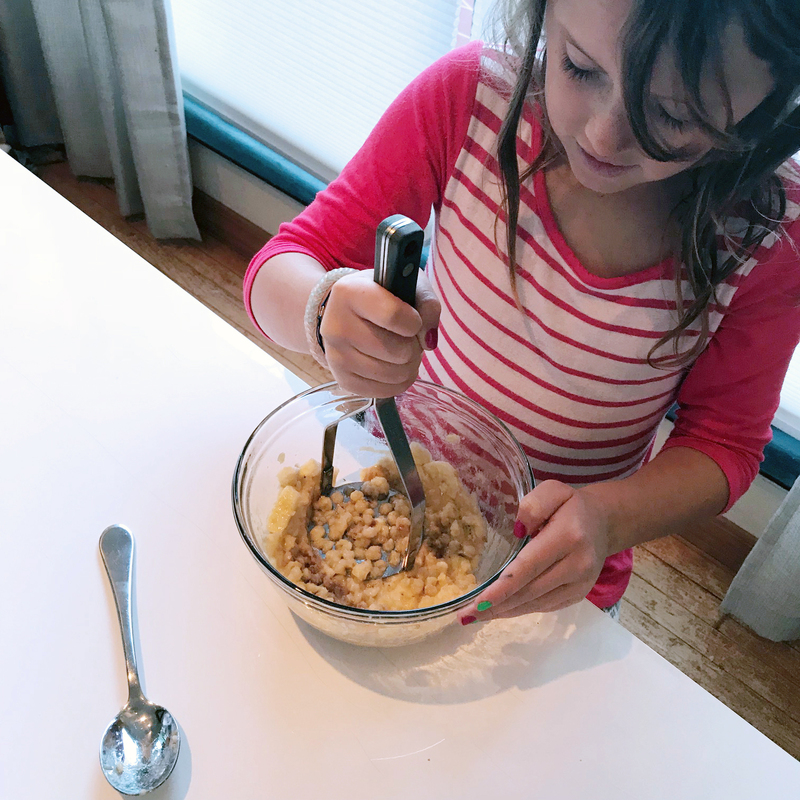 We love banana bread at our house and the small person is all grown up and more than able to handle herself around the kitchen. 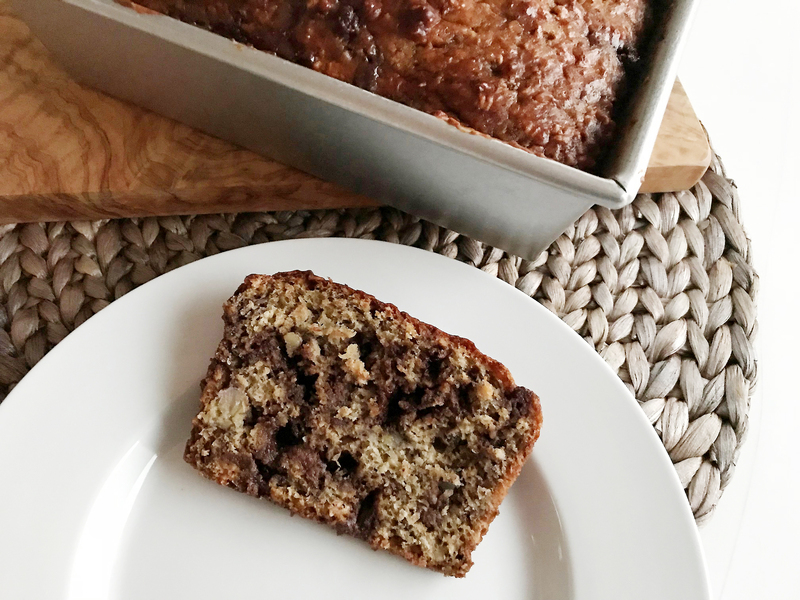 Banana bread is such a fun recipe to experiment with, letting you add bits of whatever you have hiding in the cabinet. I love letting her pull out ingredients and do some measuring for herself. Sometimes we have a winner — and sometimes things don’t work out. You’ll need three bananas and it’s good to use the ones that are icky brown. The small person likes to use a “potato smasher” to get things smooth. During a playdate we had the other day to perfect the recipe, her friend called them “poopy bananas” and I was like, yeah, you want the squishy brown ones. They really taste the best. We like using Greek yogurt instead of butter or oil and lots of vanilla. Cinnamon is also a must — we had a little explosion while making ours but hey, that’s OK. When it comes to the extras, we picked oats, chocolate chips, and hazelnuts. The bread is still good without all those chocolate chips but it really makes it (as the small person says) waaaaay better. 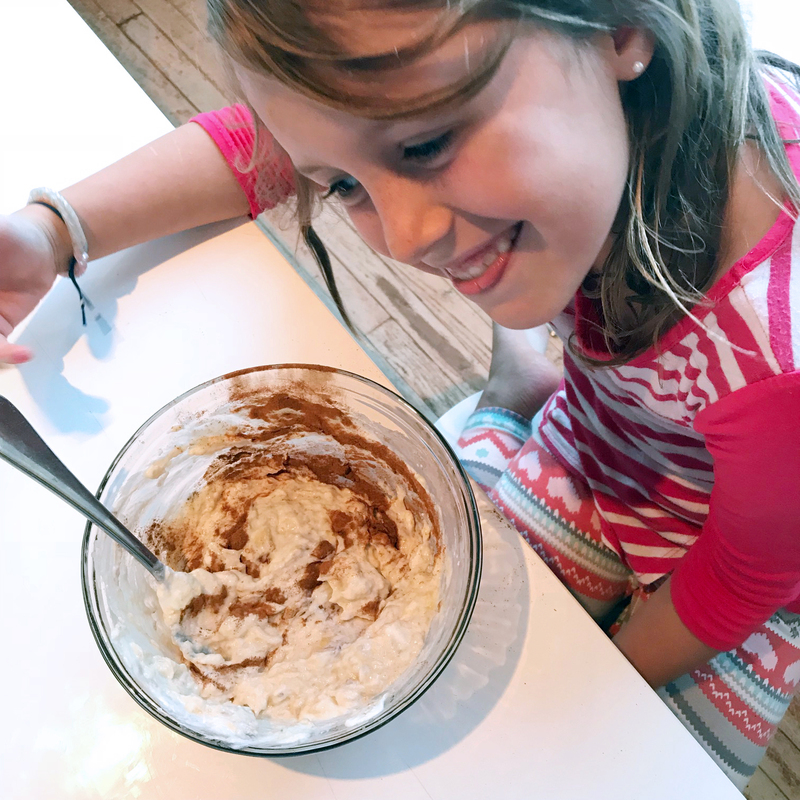 Notes from the young master baker: Remember before doing all of this always wash your hands and after too! Oh, and before you put it in the oven, put olive oil on the pan and then sugar all around it and over the sink pat it so it goes all around and it will give it a glaze. Mash the bananas together until smooth and then add the Greek yogurt and vanilla. Stir until incorporated. Add the cinnamon, brown sugar, and sea salt. Mix together and taste — because you can’t after the eggs are added! Crack the eggs together in a separate bowl to check for shells before adding. Then stir in the oats, baking powder and baking soda. Sprinkle in the nuts and chocolate chips (yes, you really need 1 cup!) and then slowly add the flour. Grease the pan with olive oil or butter and then dust with white sugar to keep the bread from sticking. Bake for 1 hour and then let sit in the pan until cooled — or for as long as you can stand it. Slice and serve with butter or use for making peanut butter and jelly sandwiches, our favorite way to make school lunch deliciously fun.